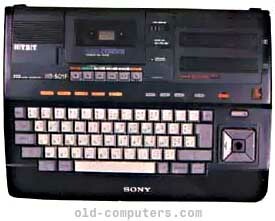 This is a quite particular MSX 1 computer as it has a tape-recorder built-in (BitCorder)with its own counter, and a kind of joystick screwable in the middle of the cursor keys, a bit like the Spectravideo SV-318. Apart from that, it seems to be the same machine as the Hit-Bit 75. There is even the same built-in software (Personal Data Bank) composed of an agenda, a memo and an address manager, with which you can save your work with a special RAM cartridge. The Hit-Bit 501 is the only MSX computer with the Sanyo PHC-30 to have a built-in tape-recorder. see more Sony Hit-Bit 501 Ebay auctions !